Searchfield Homes have started groundworks at our new 0.37 hectare site in Weybridge, Surrey, where we have planning permission to build six luxury townhouses. Oatlands Court, an apartment block on St. Mary’s Road, was purchased from a private developer and is being demolished to make way for six 3,000 square foot family townhouses, within easy walking distance of the sought-after Ofsted ‘Outstanding’ Oatlands School. 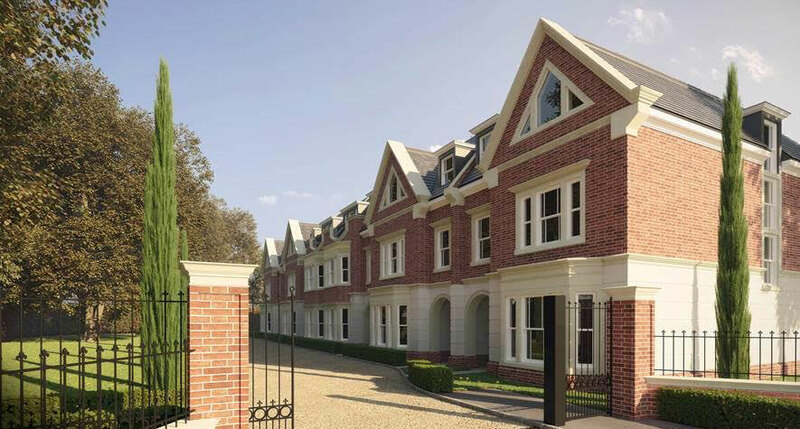 Designed to a high specification, combining traditional architecture with classic contemporary interiors, the houses will be set within beautifully landscaped gated grounds that include a private garage with one parking space for each house and further car parking in the driveway. Arranged over three floors, accommodation will include four bedrooms and four bathrooms, a study room, open-plan kitchen dining, an orangery-style family room and a formal sitting room. Each house will also include a private back garden. The development is located only half a mile from Weybridge town centre and one mile from Walton-on-Thames railway station for a 29 minute train journey to London Waterloo. Travelling by car, the M25, M3 and M4 are all within easy reach. The development is scheduled to launch in 2018. Register your interest now by calling 01252 781607.